Hard to explain why I am always expecting so much from a new Louis Vuitton collection. 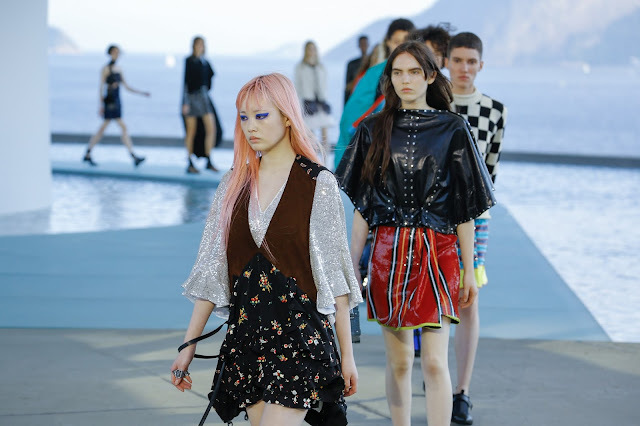 Perhaps it's due to Nicolas Ghesquière's incredible ability to design a perfect woman's wardrobe filled with desirable pieces having a kind of futuristic aura, something magnetic & mysterious, something I could picture in my wildest fashion dreams. This man is a genius, we all agree with that. His years at Balenciaga were crazy ones and the pieces he imagined are now part of an eternal Pantheon. I love his vision of a woman's body. I love the easy, radical, bold vibes of his creations. No need to tell you that I was expecting much of his Cruise 2017 presented in Rio. The pictures of his latest Cruise presented last year in Palm Springs are still very much alive in my mind, not to mention his Spring Summer 2016, a monument of fashion where everything combined perfectly; the soundtrack, the setting, the girls, the attitude and of course, the clothes. 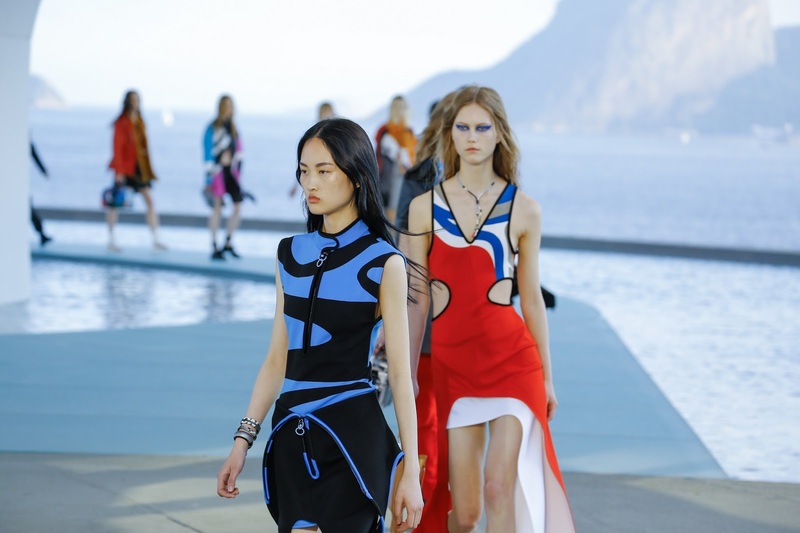 Yesterday, Nicolas Ghesquière did it again. His Rio de Janeiro collection is another proof that his vision is one of the brightest & strongest in fashion nowadays. 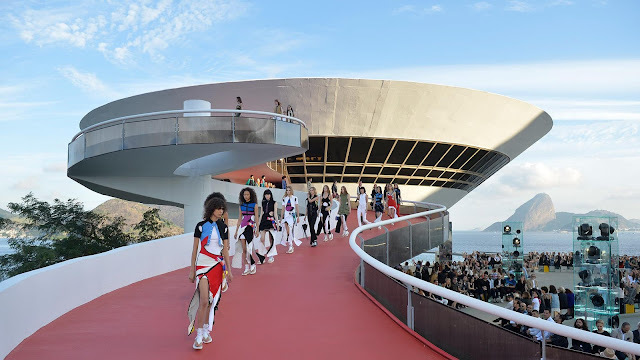 To be completely honest, I have to tell you that when the first model (my beloved Mica Arganaraz) entered the main catwalk with the Sugar Loaf Mountain in the background and La Femme's song Sphynx as soundtrack, it gave me chills, deep chills, wonderful chills. I have already told you a hundred times that I'm living for the Emotion of Fashion. I need it. I need to be flabbergasted and carried away by Fashion. 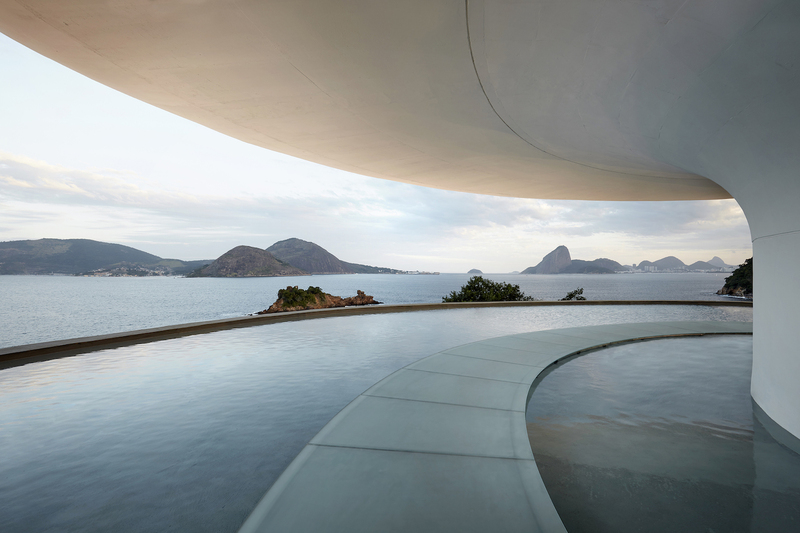 I don't think there is a better setting than the Rio MAC Niterói to present such a collection. This place could easily find its place in a depiction of heaven or in a movie about a utopian society on another planet. This monument designed by Oscar Niemeyer is a work of art; contrasting from the nature around and at the same time, having its place in the best way possible. Another thing hard to explain. 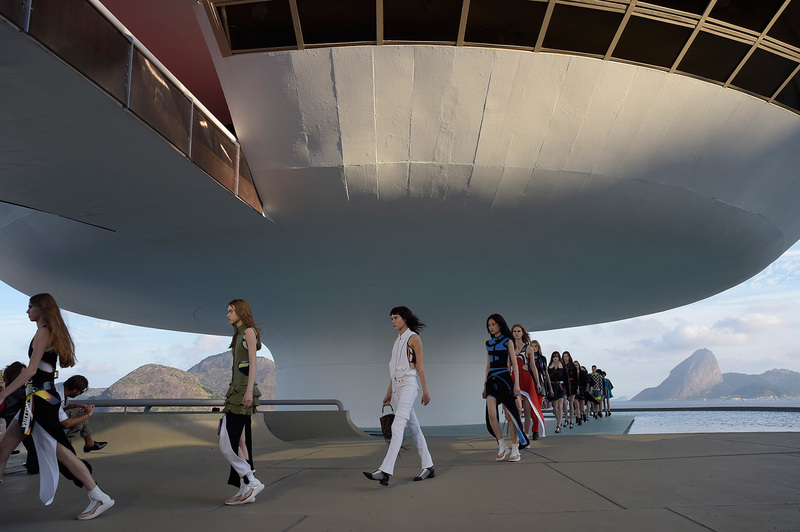 For the moment, the Louis Vuitton designer has won the Cruise battle; Ok showing a collection in Cuba or in Dubai or at the Seoul Dongdaemun is a tour de force but there is no such place as this one in Rio. A genuine postcard from Heaven. 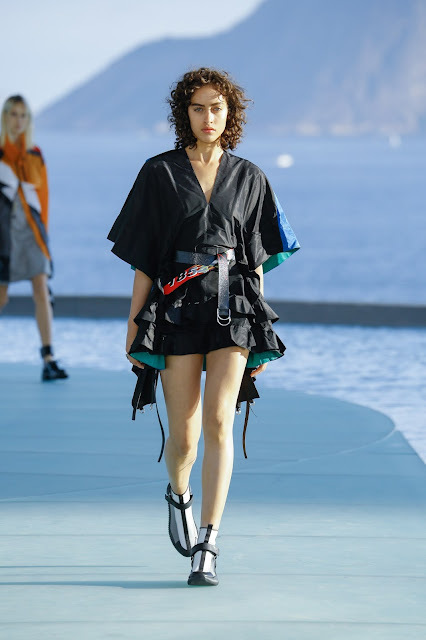 As a starting point to this Cruise 2017 collection, Nicolas Ghesquière told Vogue.com that he wanted to combine "athleisure" & sophistication: "I think what defines our time is that women want to look sophisticated and they want casual sports clothes - those are the two big obsessions". After all, the Olympics are in three months so the timing is perfect! This sporty approach can be felt in the fabrics used; some kind of neoprene or stretch fabric giving a surfing vibe to the silhouettes. Ipanema beach is not far away and some of these clothes could be easily part of the landscape. 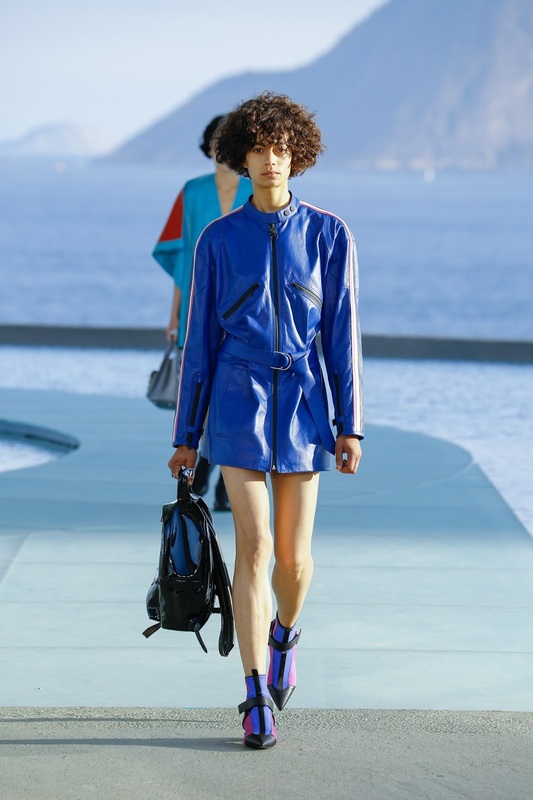 There are also nods to racing (a recurring theme for Nicolas Ghesquière, his racing pants are now part of his DNA) with jumpsuits, colourful checked patterns (an obvious nod to Louis Vuitton), light leather jackets belted on the waist and adorned with zips. A delicious impression of lightness is emerging from parachute dresses, colourful parkas/raincoats. Into these clothes, a woman's body is free and even in the more body conscious pieces, there is still a feeling of easiness & movement. A perfect mix of sleek and cool; in a way, Ghesquière's trademark. The body can breathe in these clothes thanks to slits, snap fasteners, openings revealing such parts as the hips, the navel. You have to be athletic to rock these pieces! Of course, a tribute collection to Rio & Brazil would not be complete without a wink to football/soccer in the shape of a naive print on ruffled & feminine dresses. These ruffles also bringing a very Latina vibe to the creations. Ready for Samba! All this Brazilian folklore, these tropical vibes (the iconic bags are re-interpreted with brighter colours), this easy, laid-back attitude is counterbalanced with something darker, more elegant, more city than beach. Something Ghesquière qualified as typically "Parisian" (though I'm not a huge fan of describing something as Parisian, quite reductive as far as I'm concerned...); round-shouldered leather jackets, strict neoprene military-inspired coats & jackets, super cool neo boots (contrasting with the neo flip-flops, most of the models were wearing, once again a nod to Brazil, the land of Havaianas!). A more urban side bringing something different, making all the other silhouettes even cooler & effortless. Yann & I have a kind of dream list of the places we'd love to visit, Rio is, of course, part of it. 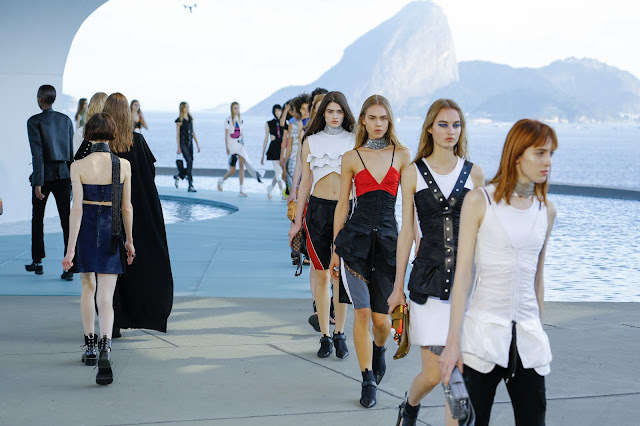 Far from all the things we can hear in the media these days about the Brazilian capital and to a larger extent about the country itself (corruption, crisis, zika virus...) Nicolas Ghesquière wanted to deliver a picture-perfect collection in a picture-perfect place. Everything seems so quiet, so peaceful, so easy, so beautiful. I know that's not how things really are in Brazil. Yet, I'm glad Louis Vuitton chose this location for his Cruise 2017. I used to think that choosing Frank Gehry's house last year for Cruise 2016 was the best idea they ever had but now, I have to revise my opinion. THIS ONE is the best location ever! I grew up in Le Havre, a modern/stern city featuring Le Volcan, a monument designed by Oscar Niemeyer. Seeing it each and every day made me forget about it. This massive white architecture is proudly standing in the very heart of the city and yet, in my eyes, it disappeared. Now, I almost want to go back to Le Havre (though it's quite painful) to take a brand new look at it. Reconsidering things with a brand new point of view, I guess that's the ultimate quality one can expect from fashion! WHAT I'M GONNA WEAR THIS SUMMER!